Stage 1. Male cones (pollen cones) and female cones (ovuliferous cones) are formed on the adult tree (the spore-bearing plant or sporophyte). The podocarps are dioecious, which means that the male and female cones are formed on separate trees. Stage 2. The male cones begin to develop in late summer. In matai up to 25 cones are formed on a slender spike. In most other conifers the pollen cones are either solitary or few in a group. Stage 3. Each male cone comprises many fertile scales spirally arranged around a central stalk. Stage 4. There are two microsporangia or pollen sacs on each fertile scale. Special cells called sporocytes inside the sporangia undergo reduction division (meiosis) to form many small spores or microspores. Four microspores are formed from each sporocyte. Stage 6. As they develop they separate, becoming four pollen grains, each containing a single haploid microspore genetically different from the parent plant. When mature the microspore germinates. This means that it begins cell division, until it consists of 10 or 11 cells inside a tough outer wall (1 body cell, 1 sterile cell, 1 tube cell and 7-8 prothallial cells). Stage 7. The cell walls of all except the body cell break down, so that the mature pollen grain contains a body cell surrounded by 9 or 10 free nuclei. At pollination time the pollen cones dry out and split open, releasing dried pollen grains, which are transported by air currents to reach the female cones of another tree. Stage 8. In early spring, female cones are formed near the tips of branches. Stage 9. The female cone consists of ovules borne on fertile bracts arranged spirally around a central stalk. Below the fertile bracts are often a few sterile bracts. At the time of pollination, the stalk elongates, separating the ovules and lifting them above the leaves. Stage 10. Each fertile bract has a single ovule on its upper surface. At the base of each ovule is a small opening, called the micropyle. Pollen grains are captured in watery droplets exuded by each ovule. The tiny air-filled sacs enable them to float up through the micropyle into the ovule to reach the surface of the female sporangium. Two pollen grains are shown, just about to enter the micropyle. Stage 11. This shows an ovule cut longitudinally through the middle of the micropyle. The ovule consists of a megasporangium enclosed in a protective layer called the integument. Around this is another layer called the epimatium. (This is equivalent to the ovuliferous scale of the pine cone). A pollen grain can be seen on the exposed surface of the sporangium. At the centre of the megasporangium is one special cell called a megasporocyte. Stage 12. The megasporocyte divides into four large haploid spores (megaspores) by reduction division (meiosis). Only one of the megaspores will remain functional. The other three abort and shrivel away. Stage 13. The functional megaspore now germinates to form a female gametophyte contained inside the ovule. 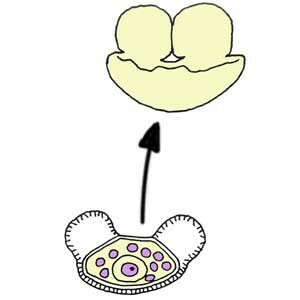 The female gametophyte enlarges by multiple divisions of the nuclei, and the ovule enlarges to accommodate it. When it has attained full size the nuclei form cell walls. Eventually the female gametophyte is a multicellular structure several millimetres long inside the ovule. Stage 14. While lodged inside the ovule, the pollen grain has been growing a long pollen tube through the sporangium tissue towards the egg-containing structures. The tube nucleus and prothallial nuclei move into the tube, leaving the body cell behind in the grain. Eventually the body also travels along the pollen tube. When all the nuclei reach one of the eggs, the body cell divides into two unequally sized sperm nuclei. Stage 15. Two to four egg-bearing structures (archegonia) form at one end of the female gametophyte. A fully mature archegonium contains one large egg cell (as in the righthand archegonium). When a pollen tube reaches an archegonium, it releases the larger sperm nucleus into the egg. The smaller one is left behind in the tube. The fusion of a sperm nucleus with the egg nucleus (fertilization) allows for new combinations of their genetic material, so that the new zygote is genetically different from both its parents. The fusion nucleus or zygote is the first nucleus of the next diploid spore-bearing plant (sporophyte) (lefthand archegonium). Stage 16. 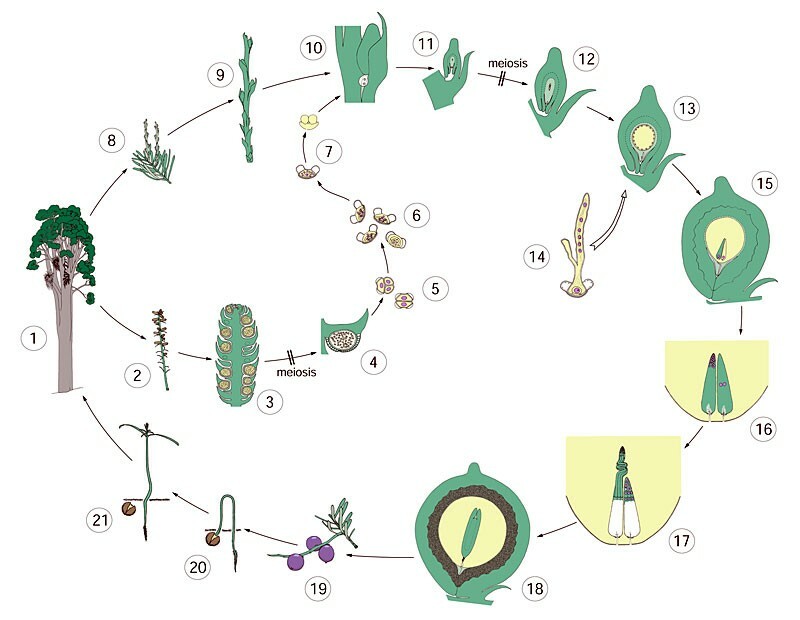 If more than one pollen grain entered the ovule at pollination, more than one archegonium may be fertilized. Stages 16 and 17 show four successive stages of development occurring in separate archegonia. The zygote divides into two nuclei which move to the opposite end of the archegonium (righthand archegonium). These nuclei divide several times, until up to 32 nuclei are crowded into the narrow tip of the archegonium (lefthand archegonium). Stage 17. The nuclei arrange themselves into two tiers, and then become enclosed in cell walls. The cells of the inner tier, after another division, will form the suspensor. The cells of the end tier will become the embryo. In podocarps the nuclei in the embryo group divide again so that the embryo is now binucleate. The suspensor cells begin to elongate and push the embryo out of the archegonium towards the middle of the female gametophyte (righthand archegonium). As the embryo is pushed deeper into the gametophyte the suspensor becomes highly coiled (lefthand archegonium). While this is happening the embryo rests in the binucleate stage. In contrast with Pinus, only one embryo forms from each archegonium, so if two archegonia were fertilized this means two embryos would be formed. Only the most vigorous one will survive. Stage 18. Once the elongating cells (suspensors) have completed their task they die. The surviving embryo enlarges as it forms a root tip, a shoot tip and two seed leaves (cotyledons). Around the embryo the gametophyte tissue is packed with stored nourishment. By now the two layers around the former ovule are maturing. The integument has hardened to form a seed coat, and the epimatium has become fleshy.